1814—During the Battle of Lake Champlain, Commodore Thomas Macdonough anchors his ships in a position that the British squadron attacks head on, using only a few guns at a time. The British squadron is defeated, ending the final invasion of the British in the northern states. USS Lake Champlain (CG 57), a guided missile cruiser, is named after the famous battle. 1942—Pharmacist's Mate First Class Wheeler B. Lipes performs an emergency appendectomy on Seaman 1st Class Darrell D. Rector on board USS Seadragon (SS 194) on patrol in the South China Sea. 1943—During the Salerno, Italy operations, USS Savannah (CL 42) is hit by a German guided bomb. The explosion kills nearly 200 of her crew, but she remains under her own power to return to the U.S. for repairs. 1944—USS Albacore (SS 218) torpedoes and sinks the Japanese auxiliary submarine chaser (Cha 165) off Kyushu, Japan, while USS Finback (SS 230) sinks Japanese army cargo ship, Hassho Maru, and merchant cargo ship, No. 2, Hakuun Maru, north of Chichi Jima. Also on this date, USS Pargo (SS 264) sinks Japanese auxiliary netlayer, Hinoki Maru, in Java Sea. 1982—USS Michigan (SSGN 727) is commissioned at Groton, CT. The second Ohio-class nuclear-powered guided missile submarine, it is the third Navy vessel to honor the State of Michigan. 2001—American Airlines Flight 77 is hijacked by terrorists and hits the Pentagon, causing 184 fatalities. Specific to DON, the fatalities are: 33 military personnel, six civilians, and three contractors. American Airlines Flight 11 and United Airlines Flight 175 hit the Twin Towers at the World Trade Center, New York City. United Airlines Flight 93 goes down in Shanksville, PA, after passengers engage the hijackers. 2010—USNS Washington Chambers (T-AKE 11) is christened and launched and now operated by the Military Sealift Command. The dry cargo/ammunition ship provides ammunition, food, repair parts, stores and small quantities of fuel for the U.S. Marine Corps. The ship is named for Capt. Washington Chambers, a pioneer in US naval aviation. National news headlines continue to be dominated with reports on Hurricane Florence. As the storm nears category 5 strength, more than one million people face mandatory evacuation orders in the coastal areas of North Carolina, South Carolina and Virginia where Florence could deliver winds late Wednesday. Adm. Christopher Grady, commander of Norfolk-based U.S. Fleet Forces, ordered all Navy ships in the Hampton Roads area to set Sortie Condition Alpha as Hurricane Florence bears down on the Eastern Seaboard reports Navy Times. "Our ships can better weather storms of this magnitude when they are underway," said Grady. Navy Times also reports that Lt. Cmdr. Michael Tremel was awarded the Distinguished Flying Cross at the Tailhook Association's annual convention for becoming the first American pilot to shot down an enemy plane since 1999. Additionally, USNI News reports that the first F-35Bs in U.S. 5th Fleet aboard the USS Essex, marking the first time the F-35B has been deployed in the Middle East. The attackers were Islamic terrorists from Saudi Arabia and several other Arab nations. Reportedly financed by Saudi fugitive Osama bin Laden's al Qaeda terrorist organization, they were allegedly acting in retaliation for America's support of Israel, its involvement in the Persian Gulf War, and its continued military presence in the Middle East. Some of the terrorists had lived in the United States for more than a year and had taken flying lessons at American commercial flight schools. Others had slipped into the U.S. in the months before September 11 and acted as the "muscle" in the operation. The 19 terrorists easily smuggled box-cutters and knives through security at three East Coast airports and boarded four flights bound for California, chosen because the planes were loaded with fuel for the long transcontinental journey. Soon after takeoff, the terrorists commandeered the four planes and took the controls, transforming the ordinary commuter jets into guided missiles. Meanwhile, a fourth California-bound plane–United Flight 93–was hijacked about 40 minutes after leaving Newark International Airport in New Jersey. Because the plane had been delayed in taking off, passengers on board learned of events in New York and Washington via cell phone and Airfone calls to the ground. Knowing that the aircraft was not returning to an airport as the hijackers claimed, a group of passengers and flight attendants planned an insurrection. One of the passengers, Thomas Burnett, Jr., told his wife over the phone that "I know we're all going to die. There's three of us who are going to do something about it. I love you, honey." Another passenger–Todd Beamer–was heard saying "Are you guys ready? Let's roll" over an open line. Sandy Bradshaw, a flight attendant, called her husband and explained that she had slipped into a galley and was filling pitchers with boiling water. Her last words to him were "Everyone's running to first class. I've got to go. Bye." At 7 p.m., President George W. Bush, who had spent the day being shuttled around the country because of security concerns, returned to the White House. At 9 p.m., he delivered a televised address from the Oval Office, declaring "Terrorist attacks can shake the foundations of our biggest buildings, but they cannot touch the foundation of America. These acts shatter steel, but they cannot dent the steel of American resolve." In a reference to the eventual U.S. military response he declared: "We will make no distinction between the terrorists who committed these acts and those who harbor them." Operation Enduring Freedom, the U.S.-led international effort to oust the Taliban regime in Afghanistan and destroy Osama bin Laden's terrorist network based there, began on October 7, 2001. Bin Laden was killed during a raid of his compound in Pakistan by U.S. forces on May 2, 2011. 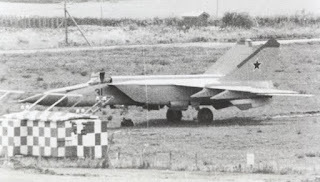 42 Years Ago This Week . .
Do you recall . . the daring defection of a Soviet MiG-25 pilot escaping Siberia while flying a highly-secret, supersonic MACH 3 + jet fighter nicknamed . . F-O-X-B-A-T ? Hmmm . . my USAF 55H Pilot Training Class Cuban roommate . . Martin Klein . . was shot down . . then smack-ed his MiG-21 jet fighter . . into that 97 mile chunk of ocean between Havana, and Key West . . killed by MiG-21 fighter pilots loyal to Fidel Castro . . secretly ' hanging up there ' at 50M . .
length above gray black swells. Absolutely noticed by startled and stunned Japanese boat fishermen . . Belenko's wide white vapor trails spiraled from the MiG-25's angular wingtips . . in a quickie rudder-assisted turn . . nearly carving the tops of the cross-hatch swell system. It had quickly become the second Japanese fishing boat Belenko was forced to bank hard and away to avoid . .
as surrounding Zero visibility small rain squalls marched into his path. to kill the extinct B-70 Mach 3 super-bomber SAC Gen'l LeMay had sidelined as . . extremely non-stealth vulner-able. no doubt were in the air to intercept and either shoot him down. Or hopefully lead him to nearby Chitose Air Base to safely land. Assuming his jet fuel held out. But the Japanese Phantoms didn't show up. So, he hauled the Foxbat's stick back into his lap . . and forced the huge, boxy jet fighter . . to claw back up through the same thick clouds in a last angry climb . . to face death . . just a handful of fuel-starvation minutes away. Against air traffic . . on his final approach . . he nearly collided head-on with a 727 airliner. But the intentional near miss was better than ' punching out ' . . and lose his high value bargaining chip : the top-secret MACH 3 FOXBAT. Belenko's landing wasn't pretty . . as he manhandled it down . . stuck on the asphalt . . but he was going too fast . . not thinking about the FOXBAT's drag chutes . . he really got on the brakes . . to crash it a little bit . . just beyond the runway's end. to excitedly click away with their ever-present cameras. Nearly all of them ' ran for it.' Although many of them continued capturing the Foxbat's high-value images . . as they ' peeped' from behind their vehicles in the ever-increasingly traffic jam. It was the biggest thing to ever occur in my 15 year old model airplane builders's young life . . jumped on my bike . . peddled as fast as I could . . to a nearby hobby shop to consult with its owner/friend. Over and over again, we poured over the grainy, brand-new news photos of the most exotic highest flying . . fastest, most secretive fighter plane on Earth . . that had just fallen into ' our ' hands of American intelligence. Flight Lieutenant Viktor Ivanovich Belenko, an elite Soviet Air Defense Forces, had defected with the most secret operational combat aircraft of the era. Quickly the Foxbat . . had been repaired . . prepped and ' Chuck ' Yeager was about to fly it. . . a loose thread that became longer and longer. Russians hardened their attitudes about Belenko betraying his mother land . . much like many American's case-hardened Jane Fonda's negative image. And many Russians still hate Viktor Belenko's guts for stealing mother Russia's most prized combat aircraft. Russia attacked the Ukraine to steal back Crimea's World Class seaport in Ukraine's Crimea.] And extreme Negative emotions feelings are running high against the Russians. and Sukhois for decades. 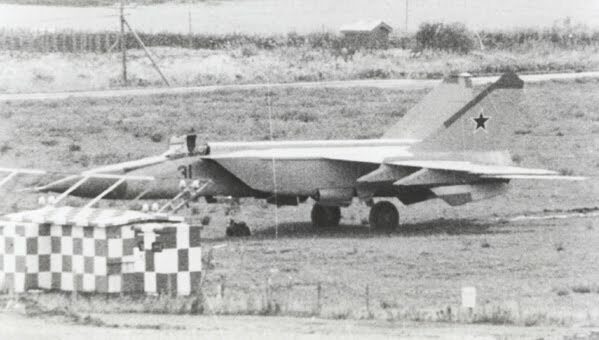 But Belenko's gift of the Foxbat, led the CIA to an enormous intelligence coup of soph-isticated but also some laughingly unsophisticated technical data. Personally, Belenko entered a netherworld. While U.S. President Gerald Ford granted Belenko asylum in the U.S. and the CIA paid his bills and built a life for him as a pilot and consultant . . neither side could fully trust the man. Viktor Belenko has adapted well to daily life . . got married . . flew for the U.S. military now enjoys retirement our culture [ Ed. perhaps in north central U.S. . . The studies listed above and many more show that no amount of alcohol is "safe" or beneficial. Whatever you decide about your own consumption of alcohol, do not base your decision on bad information from the alcoholic beverage industry. The Starr Report that brought Bill Clinton to a House impeachment vote...which the Deep State SenTors refused to vote upon! About | Email | Archive Joseph Farah is founder, editor and chief executive officer of WND. He is the author or co-author of 13 books that have sold more than 5 million copies, including his latest, "The Restitution of All Things: Israel, Christians, and the End of the Age." His upcoming book, "The Gospel in Every Book of the Old Testament" is set for official release in September. Before launching WND as the first independent online news outlet in 1997, he served as editor in chief of major market dailies including the legendary Sacramento Union. Three years before four airliners hijacked by jihadists would crash into New York's Twin Towers, the icon of financial prominence, the Pentagon, the symbol of military power, and an obscure field in Pennsylvania – all told resulting in the deaths of nearly 2,000 Americans and setting the country on a course of decades of costly wars and economic and social calamity – the U.S. faced a political and cultural crisis of a different kind. It was "the other 9/11" – the day America lost its innocence. It was the day Congress released "the Starr Report," which included 11 possible "high crimes and misdemeanors" and setting off a chain of events that would lead to the impeachment of President Bill Clinton just three months later. There was no Facebook or Twitter back then. "Google" hadn't yet become a verb meaning to search the internet. Yet, somehow Americans got the news breaking too fast for even 24-hour cable news to digest. There were no "blogs" let alone a "blogosphere." There was the DrudgeReport, which played such a critical role in the unfolding national melodrama, WorldNetDaily, the first independent, alternative online news-gathering enterprise, later to become known as WND, and the palace guard known pretty much known as the rest of the media. Clinton's presidency would survive when the Republican Senate refused to hold a real trial, let alone convict on charges of perjury and obstruction of justice. But America would never again be satisfied being spoon-fed the news in quite the same way. The seismic political after-effects were felt in the presidential election of 2016 and are still reverberating today with another controversial special counsel investigation of another president. Back then, before the "#MeToo" movement, the lives of women like 22-year-old White House intern Monica Lewinsky, Paul Jones, Juanita Broadrick, Kathleen Willey and dozens of others, were dismissed by the political and media establishments, as well as first lady Hillary Clinton, as little more than political "collateral damage." Still, what we euphemistically call "the mainstream media" would not report the details of President Clinton's sexual escapades in the White House nor the cover-up that led to the first perjury and obstruction charges against a sitting U.S. president since the 19th century. Almost forgotten in the events of that "other 9/11" is Clinton's White House breakfast with religious leaders in which he claimed to have "a broken spirit." "I have been on quite a journey these last few weeks to get to the end of this, to the rock-bottom truth of where I am," Clinton said. "I don't think there is a fancy way to say that I have sinned. It is important to me that everybody who has been hurt know that the sorrow I feel is genuine. First and most important, my family, my friends, my staff, my Cabinet, Monica Lewinsky and her family and the American people. I have asked all for their forgiveness." He went on to say: "I have repented. I must have God's help to be the person that I want to be – a willingness to give the very forgiveness I seek, a renunciation of the pride and the anger, which cloud judgment, lead people to excuse and compare and to blame and complain." He would not step down, though. Instead he offered to seek "pastoral" counseling while instructing his attorneys "to mount a vigorous defense using all available, appropriate arguments." An entire generation understandably recalls few of the details of what actually transpired in those momentous and historical days 20 years ago. Perhaps the best account can be found in former House impeachment manager James Rogan's comprehensive book, "Catching Our Flag: Behind the Scenes of a Presidential Impeachment." Item Number:1 Date: 09/11/2018 AFGHANISTAN - SUICIDE BOMBER KILLS DOZENS IN ATTACK ON PROTEST (SEP 11/TN) TOLONEWS -- At least 30 people have been killed and 57 injured in a suicide bombing in Afghanistan's eastern Nangarhar province, reports the Tolo News (Afghanistan). On Tuesday, the attacker detonated his explosive device near a protest in the Mohmand Dara district, which lies between the city of Jalalabad and Pakistan, said the governor. The provincial public health directorate confirmed 30 fatalities. The deputy chief of the provincial council said more than 50 people were killed. The demonstrators were calling for the dismissal of Bilal Pacha, a local police commander. There were no immediate claims of responsibility. The Taliban denied involvement, reported the Voice of America News. Both the Taliban and ISIS are active in the area. Item Number:2 Date: 09/11/2018 AFGHANISTAN - TALIBAN FORMING DELEGATION FOR TALKS WITH U.S. (SEP 11/REU) REUTERS -- The Taliban is preparing for peace talks with the United States, reports Reuters. Taliban leaders have been discussing the makeup of the delegation to represent the group, as well as the agenda, said two anonymous officials. The Taliban delegation will include three or four members, said the officials. It will be led by Sher Mohammad Abbas Stanakzai, who is the head of the Taliban's political office in Qatar. Negotiations could touch on a possible prisoner swap. If the talks go well, further meetings might follow. Talks between the Taliban and a U.S. State Dept. official were held in Doha in July, the Wall Street Journal reported at the time. Washington has expressed interest in talks to end the 17-year war. Meanwhile, the U.S. has stepped up airstrikes and training of the Afghan military, while the Taliban has escalated attacks to increase pressure on the government in Kabul. Item Number:9 Date: 09/11/2018 NORTH KOREA - KIM SEEKS ANOTHER MEETING WITH TRUMP AMID STALLED DIPLOMACY (SEP 11/WSJ) WALL STREET JOURNAL -- The White House says it's working on a second meeting between President Donald Trump and North Korean dictator Kim Jong Un, reports the Wall Street Journal. Press secretary Sarah Sanders said on Monday that President Trump had received a letter from Kim requesting the meeting. The letter was "very warm" and "very positive" and evidence of progress in the relationship between the leaders, she said. Trump touted his first meeting in June with Kim as a success, saying that the leaders agreed to denuclearize the Korean peninsula. Intelligence estimates since then have indicated that work on nuclear-capable weapons continues, while negotiations have floundered. Pyongyang uses a different meaning of denuclearization than Washington, further complicating talks, said analysts. North Korea argues that the U.S. needs to make the next concession and sign a declaration of its intent to formally end the Korean War. Item Number:16 Date: 09/11/2018 VIETNAM - MORE THAN US$1 BILLION WORTH OF WEAPONS ORDERED FROM RUSSIA (SEP 11/TASS) TASS -- The Vietnamese government has ordered weapons and military services worth more than US$1 billion from Russia, reports Russia's Tass news agency. The announcement followed a meeting between Nguyen Phu Trong, the general secretary of the Vietnamese Communist Party, and Russian President Vladimir Putin in Moscow on Sept. 6. Details of the arms purchase were not disclosed. Vietnam previously purchased six Hanoi-class attack submarines, several warships, fighter jets and other military equipment from Russia, its largest weapons supplier, noted Reuters.